Have you ever taken a bunch of pictures then come home, pulled them up on the computer and one really grabs your eye? You think, 'oh yeah, this is beautiful'. That's what this picture did for me. The scene looked better than I remembered when I shot it this afternoon. Tranquil, lovely, and a perfect shot. Wow, Sharon. This is a magazine cover. I thought the same thing when I saw this photo... beautiful! Exquisite shot! The details of the tiniest twigs in the foreground and that gorgeous reflection! Love the quote too! Thanks for sharing! Thanks for sharing it with us. Hope you are enjoying your weekend. Oh...that is a fabulous shot. I enjoy your site so much, Sharon! It brightens my day...seriously. What a beautiful scene, absolutely love the reflection! Wow that's stunning! it almost looks fake; like a painting more than a picture. Stunning! Wonderful reflections for a reflective season. Gorgeous photos. I hope you are having a wonderful weekend. 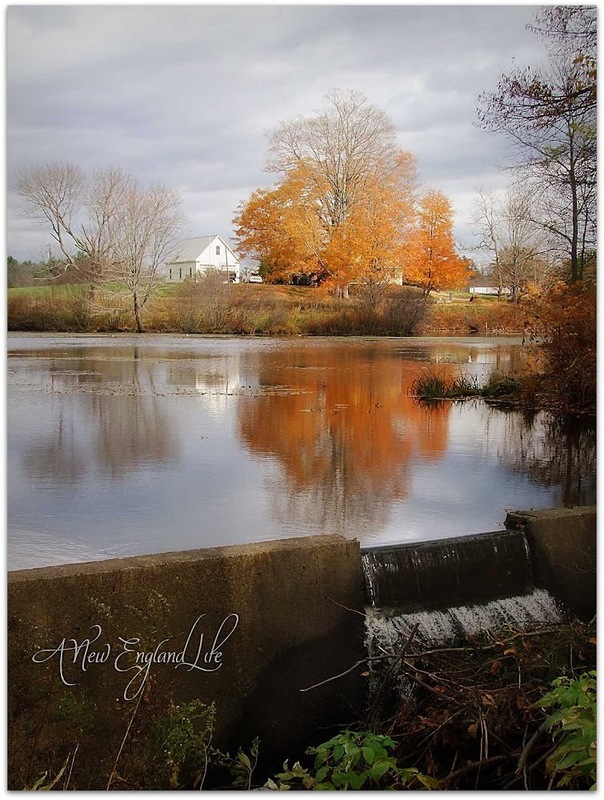 Captures your New England autumn perfectly! It does look like a magazine cover photo. I'm still loving your banner photo best though! You should submit that photo to Yankee magazine! It's beautiful! Happy Halloween! Sharon, this is absolutely stunning! This photo really takes one in. You must live in a very beautiful place, but you obviously have an eye for that special shot. Oh yea! that's what I'm talkin' about. Oh Sharon ~ that picture is fabulous!!! The essence of fall, captured on your camera. Is it okay if I use if for my desktop background? Absolutely wonderful, you muxt get it published. Hi Sharon! Autumn done just right and this photo is done just right. Absolutely stunning image. In fact all your autumn images are glorious! Thank you for visiting – I really appreciate your kind words. New England is so beautiful this time of year. A lovely spot and well photographed..of course it should be one of your favorites..it turned out perfect! A stunning view! It could be an old fashioned painting. And I like the quote you placed beneath it in such beautiful script. Leaves are the flowers of autumn aren't they. Thanks for your comment at Secrets Sharon, v kind.